Arouse the enthusiasm of your customers with style fusion in the bathroom. Axor Urquiola is rich in detail and can be combined in a variety of ways to achieve a customised bathroom. The imaginative collection's design combines soft shapes with asymmetries and large surface areas. In planning your bathroom you can opt for mixers that look just like they evolved naturally, for example. You can also play with nostalgic associations aroused by the wash basin and bath tub. Each Axor Urquiola element possesses its own charm and combines with the other items in the room to create a homely unit. Axor Urquiola basin mixers are available in various heights and variants. They go perfectly with a wide range of different built-in and counter top wash bowls, particularly with the characteristic wash bowls in the collection. For the bath tub, your customer can create combinations using mixers for the bath tub rim and wall or a floor-standing thermostat. Matching shower mixers, thermostats and shut-off valves are available for the shower. In the shower area, the shower column with thermostat and overhead shower perfectly captures the design principle of Axor Urquiola. Various overhead showers for wall or ceiling mounting and various hand and side showers that match the collection are also available. Supplement the style fusion of Axor Urquiola with the numerous accessories from the collection: ranging from the bath towel holder and soap dish to the wall hook, the toothbrush tumbler and lots more. 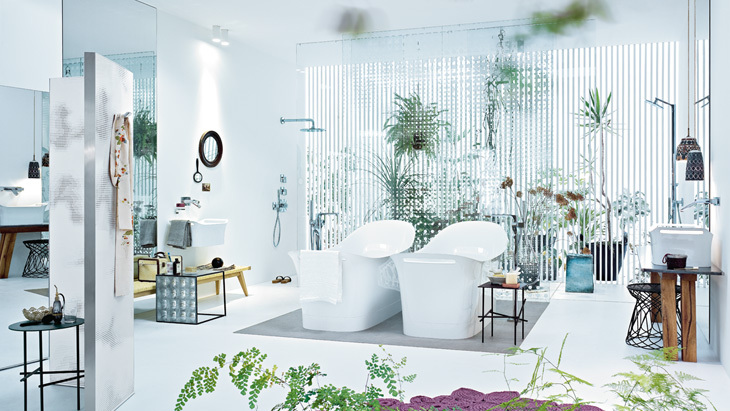 The style of the Axor Urquiola bathroom is defined by the bold wash basins and wash bowls in two sizes. Like the free-standing bath tub, these are made of mineral casting. The advantage of using this material is that it is pleasant to the touch and easy to maintain. When selecting the wash basin, your customer can choose between a wall mounting and counter top version. Which wash basin matches Axor Urquiola?